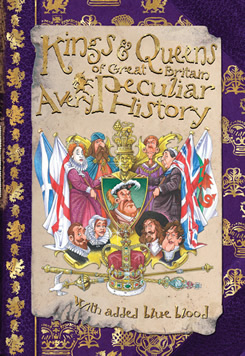 This small-format book of 192pp is a fun-packed, fact-packed romp through the history of the Kings and Queens of Great Britain (well, essentially England and Scotland). Full of dire deeds and eccentric oddities, it’s also got all the basics about dates and succession, so you can have fun while you swot up for that Quiz Night or University Challenge. The “Very Peculiar History” series forms part of Salariya’s “Cherished Library”, “designed to look and feel like fine editions from a cemetery of forgotten books”.